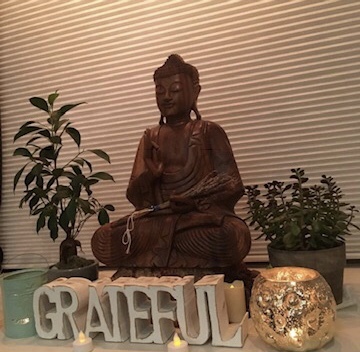 Gratitude is such a focal point during the month of November, but you may notice we encourage it in our classes year-round. We may take a moment at the end of class asking you to call to mind someone who made it possible for you to be on your mat in the studio, and then send that person love and gratitude. Sharing a little bit of yogi magic to seal of your practice. What if you took that little bit from the end of class and meditated on it for five or ten minutes? A gratitude meditation is more than just the politeness of saying “thank you”. In fact, meditating on what you are grateful for is one of the easiest ways to immediately feel happier. Studies have shown it can decrease levels of depression, lower blood pressure, improve overall mood, increase trust, boost immunity, and even help with better sleep. Set up for your meditation by finding a comfortable seat. Feel your sit bones rooting to the earth. Spine straight, but relaxed. Crown of the head reaching for the sky and a gentle tilt of chin toward chest. Allow your hands to rest gently in your lap. Find ease and comfort in this position. Take notice of the sounds in the area around you and then focus on the sound of your breath. Follow each inhale and exhale, allowing yourself to settle into this moment. If extraneous thoughts arise, let each one pass like clouds across the sky. After a few moments of quiet reflection, press palms together to meet at heart center. Be grateful this meditative practice as you let your eyes gently open. As your eyes reopen to the world around you, check in with your body, see how you feel. Explore how the meditation affected you. If you want to take this meditation one step further, start a gratitude journal. Take a moment to write down what or who you are thankful for each day and watch your positive energy flourish! Emma Bouthillette discovered yoga as a supplement to her gym workouts in 2012, but by 2013 her gym visits lessened and so did her visits to the yoga studio. With encouragement from her mental health providers, Emmastarted practicing yoga at home in 2016 and found Samudra in the spring of 2017 when she signed up for a “mantra, movement, and meditation” workshop. It was love at first “om” and her practice flourished from there. As a writer with a digital marketing background, she writes for Samudra’s blog and newsletter. Emma completed her teacher training this past spring at Samudra’s first Fluid Yoga teacher training. When she’s not on the mat, Emma enjoys time with her corgi, Savvy, reading, and writing. Celebrate Gratitude With Our Community -Squadsgiving Team Taught Class! Healing through a car accident with yoga, and opening Samudra! Join our mailing list to receive the latest news and updates from Samudra Studio.